For week 4 of my Artfully Fresh Foyer One Room Challenge, I hit a wall — literally and figuratively. As I was thinking through the whole project in my head — foyer, up the stairs, second floor landing — I realized that I had a whole lot of wall space to fill. 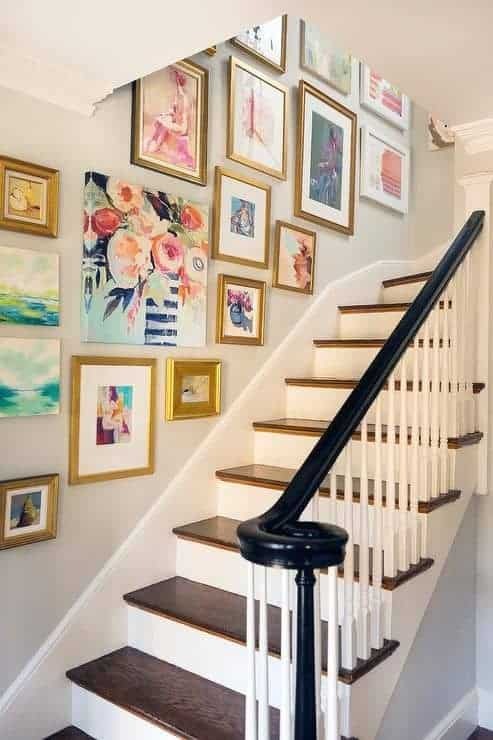 One might say, “You should do a gallery wall up the stairs!” Now, I have no doubt — no doubt — that nearly ever person reading this blog has pinned about a trillion images of gorgeous gallery walls, some of them up staircases. The homeowners/designers serendipitously brought these galleries together from about 10 years of traveling the world in their 20s and 30s, always on a shoestring budget but enough $ to pick up art (instead of eat) and carry it with them. Beautiful. 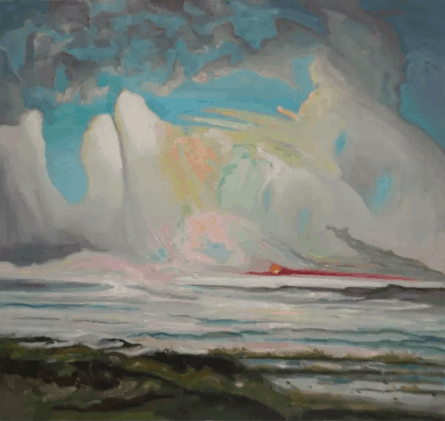 But let me shatter the illusion — great gallery walls are usually expensive and hard to do. If you have 5 pieces, even if you’ve purchased each piece for under $100, the frame job will be at least $150 each (and that’s if there aren’t any biggies, and you always want at least one biggie). Low estimate: 5 X $100, + 5 X $150 = $1,200. Furthermore, there is an art to creating a good gallery wall — theme, color, size, the elusive “mix,” etc. For all the amazing, seemingly effortless gallery walls on Pinterest, how many cobbled-together-with-5x7s-and-8x10s-in-table-frames gallery walls have you also seen? Not the same effect, right? If you lack the budget — and the eye — it ain’t gonna work. Sure, you can rip out pages of a calendar and frame them in poster frames. I did that in my 20s. But I’m in my forever home now. Even if I’m still on a budget, I want things that are going to stay there for a good 10 years and be the images my kids remember running past. Moreover, my handsome husband has this “thing” where we can’t have anything on our walls that isn’t meaningful to us as a family. Anyone else out there have a SO with this seemingly harmless and reasonable demand? Do you have any idea how tough that is on a decorator?!?!?!?!?! No saying, “Oh but this one has all the right colors and it’s the perfect size!” for me. I can’t go on Art.com and just pick a bunch of prints that look nice together. Lastly, I know a lot of people like a ton of family pictures hung in a gallery going up the stairs. I didn’t want to go this route for two reasons: 1. 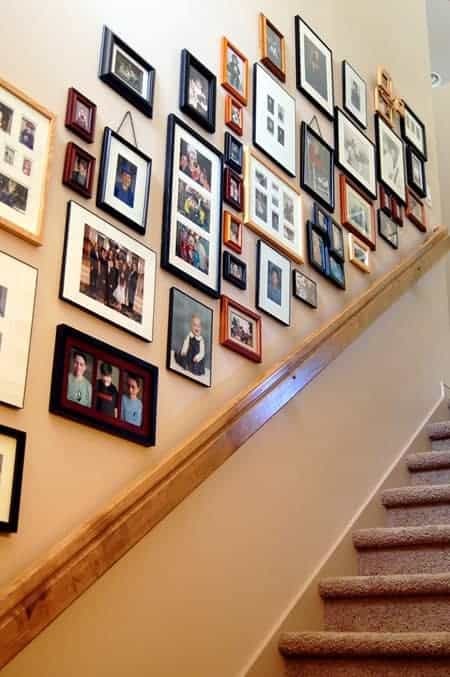 My stairs are in my foyer, and I like to keep most family pictures in the areas of the house that are private, and 2. What can I say? As much as I like to keep images of my family around me, this look just doesn’t do it for the decorator in me. Sorry. So, for this project, a gallery wall is OUT. What to do? With a house as old as mine (225+ years), I try to incorporate historical features wherever I can, and I especially like when I can give tradition a bit of a twist. Silhouettes, or portraits done in profile cut from black card stock (but sometimes traced and painted), became popular in the mid-18th century. They represented a cheap alternative to a painted portrait and skilled specialist artists could cut a high-quality bust in a matter of minutes. I like the way they bridge the genres of art and photography; I think they would make a good transition from our public foyer to our personal bedrooms on the second floor. The tracing of silhouettes can be linked to historical precedents like Classical black-figure vases, the ancient Chinese art of paper cutting, and even the legendary origins of picture-making, itself. Pliny the Elder, writing around the 1st century AD, told the story of a 5th century Corinthian girl, Dibutade, who traced her lover’s shadow, cast by candlelight, because he was leaving on a journey and she wanted to keep his image with her. The Dibutade story is interesting not only because it describes the same candlelight method favored in the 19th century, but also because the artist is a woman, an amateur, who wants a souvenir of her beloved. These were often the circumstances under which silhouettes were created. It even became something of a parlor game for women in the 19th century. Because of its simplicity, and because the shadow could be traced against a wall, it did not require training or even much skill, and it fit into the expected amateur artistic pursuits of the Jane Austen-era woman. You know me, I like anything Jane Austen. Emma Thompson even inserted silhouette drawing into her 1995 Academy Award winning screenplay of Sense and Sensibility, imagining a flirtatious scene wherein Marianne draws a silhouette of Willoughby by candlelight. It’s super easy. You upload an iPhone pic of your loved one in profile and choose your color and frame. I chose charcoal, because I didn’t want the starkness of black, and a carved natural finish frame. A day or two later, Minted emailed me a proof for approval. Good thing they did, because I made one of the boys blueberry in color! Oops! Ok, LONG winded explanation of my choice for stair art. But then I got to shopping around Minted more than I ever had before, and I was surprised to find a number of custom art options. While there, I made a few more “personalized” purchases because, as I discussed, it’s a lot of wall space. In addition to Minted’s custom silhouettes, I was also smitten by their custom maps and custom house portraits. I like to mix vintage and new. While I could have framed an old town map, I admit that I sprang for the Minted’s option. Minted even allowed me to put a star where our house is on the map. I declined to bite on the house portrait because I have a old photo print of our house from the 1850s that I copied from the town historical society. Hopefully the mix will work! I’m still waiting for the photo from the framers before I hang them. Finally, I really did want to get some family photos on the second floor landing. I had to shoot a bunch of photos on the first day of school to get a keeper. The kids were hamming it up, and because it was such a dark and dreary day, I had to have my camera’s shutter speed on super slow, resulting in lots of blurred images and funny faces. However, when I looked at them in sequence, I loved them all together! I gave them Minted’s Aquarelle treatment, a watercolored version, which I felt made them feel a little antiqued and painterly at the same time. Any thoughts? You can totally disagree with me on the family pics up the stairs issue. I’ll be back on Saturday with a style spotlight on my favorite designer of 2016 and then next Thursday with my ORC Week 5 — flooring, including an online source for stair runners that you can use even if your stairs turn, like mine do! Many thanks to Minted for sponsoring this post. All opinions are my own.